The Alphabet Network is cooking up a yummy holiday episode. TV Insider reports season two of The Real O’Neals TV show on ABC will feature celebrity chef guest stars: Graham Elliot, Alex Guarnaschelli, and Antonia Lofaso will appear as themselves in a fantasy sequence, which occurs when Kenny (Noah Galvin) sets out to make Thanksgiving dinner for the family. 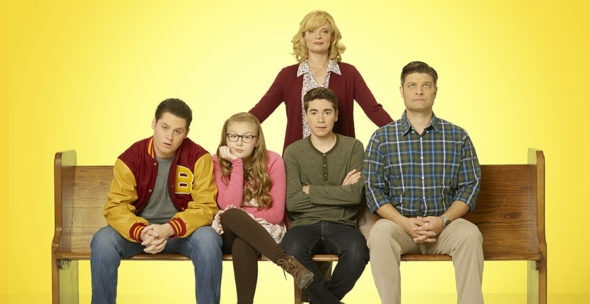 The Real O’Neals also stars Martha Plimpton as Eileen, Jay R. Ferguson as Pat, Matt Shively as Jimmy, Bebe Wood as Shannon, and Mary Hollis Inboden as Aunt Jodi. Other guest stars set for the second season of the family sitcom include Jane Lynch, Lance Bass, and Tyler Oakley. Elliot was a regular judge on MasterChef from 2010 to 2015, and on MasterChef Junior from 2013 to 2015. Food Network fans will recognize Guarnaschelli and Lofaso from shows including Chopped. What do you think? Did you catch the first season of The Real O’Neals TV series? Do you plan to tune in for season two on ABC? More about: Chopped, Chopped: canceled or renewed?, MasterChef, MasterChef Junior, MasterChef Junior: canceled or renewed?, MasterChef: canceled or renewed?, The Real O'Neals, The Real O'Neals: canceled or renewed? I love the show. Looking forward to season 2.